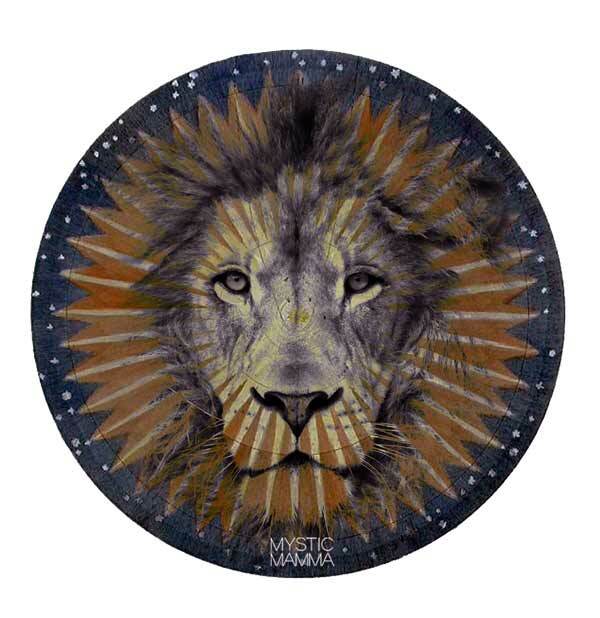 “Give a giant roar from your heart and claim your royal, inner Leo! “Mars reenters Sagittarius on the day of New Moon after retrograding starting in mid April, moving all the way back into Scorpio in late May, and now reentering Sagittarius. “There have been experiences of deep rage released during this retrograde season fueled by the dwarf planet, Eris named for the goddess of Strife and Discord, conjuncting Uranus, the Awakener, both in Aries (Mars rules Aries). “Deep need to express injustice and rage has awakened as a theme in our culture and in ourselves as these two spiritual rebels, Eris and Uranus, have come together for the first time since Eris was ‘discovered’ and named. “Saturn in masculine, fire sign Sagittarius supports the Sun and Moon in Leo suggesting we can take the higher road in our interactions where discord appears. “Saturn brings us the discipline and maturity to defer to what we know as right while Sag helps us see a larger meaning and bring understanding to the events we are witnessing and bring our hard won wisdom to bear. “This is a time of HUGE transition on more levels than can be counted. Bring out the best china and eat from the table of generosity, togetherness, abundance, diversity and gratitude. “We are going for higher consciousness here and we need to nourish ourselves with only the highest frequencies available and share all the many resources we have. “A mildly stressful aspect from Neptune to the Sun and Moon may call on us to stay out of illusion and disillusionment and trust our intuitive knowingness. “We may be called on to offer our compassion, love and asylum to those who are caught far from their hearts and who need support again finding their own true nature. Pulling in the hugely healing use of our imaginations for ‘true play’ may ease stress all around. “The asteroid goddesses have conspired to bless us with the gift of a Grand Trine in water signs once again. Water signs bring forth our receptive yin energies and help clear us to stay in emotional ‘flow’. “The water element soothes, nourishes, and supports, so allow Pallas Athena (Pisces), Juno (Scorpio), and Vesta (Cancer) to join hands around you and bless you with creative inspiration and energetic healing, powerful relationship commitment, and devotion to the sacred work you do. “This subtle and benevolent frequency of being in sacred and inspired relationship to others is a mirror of where we want to be as we release the past and embrace the new. “The past two lunations, involving contacts with Pluto (an object symbolic of archetypes antithetical to the Sun), can have the effect of dampening personal significance. “Plutonian events can mitigate willpower as they dredge up an awareness of harsh realities beyond one’s control. That may have been a subtle or significant experience over the past month for you. “In the awareness of the shadow, the ego can often feel frightened or overwhelmed in the face of such powerful inner truths. If you’ve felt that way recently, focus your attention on this lunation as a source of motivation and self-definition. “Saturn’s trine to the New Moon from Sagittarius promises that effort and hard work (begun now or from past efforts) will accelerate progress toward certain goals and objectives. “New life is being put into motion at this lunar beginning. Never underestimate the life force–the will to live. It moves through us biologically as well as spiritually. “Whether you’re conscious of it or not, it moves far beyond your body, shaping the experiences throughout your daily life. If you desire something, know that the life force will see to it that you have the opportunity to attain it. “With this Leo New Moon, perhaps you simply need a reminder of the joy and playfulness that is an essential part of our human experience. And also, if you make the effort, you can find stability and purposeful direction in your life. “Mystics across the centuries, for instance, have spoken of the Sun as a doorway to the realms of spirit. The Sufi teacher Pir Vilayat speaks of the Sun as a great Archangelic Being. “Ancient Sufis spoke of the ‘Midnight Sun’ as a way to describe the soul’s encounter with the Divine. ‘Sun of the mystery,’ ‘Sun of the heart’, ‘Sun of the spirit’—these are among the invocations used by the 13th-century Sufi Najm Kobra in his teachings on light. “How can we rekindle the light of our soul hidden within us? How can we experience the Divine Light that is our original nature? To begin with, it helps to concentrate on the light we see reflected in nature. “Find a place to meditate outside, or position yourself near a window. Soak in the sunlight that shimmers through the air and lovingly caresses the trees and plants. “Feel yourself warmed by the Sun’s rays; allow your body to be filled with its vital, life-giving magnetism. “Close your eyes and, as you inhale and exhale, breathe in sunlight until your whole body is vibrant with light. Feel your aura radiate. Let your consciousness expand into space; be awed by the fiery plumes of light exploding from the Sun’s corona. Spin with the planets as they encircle it’s mother star. “Next, imagine that your whole psyche is being bathed in a shower of light. Allow every dark corner of yourself to be lit up; experience the Sun’s kindness as it generously melts away your fear, shame and guilt. “The Sun is the ultimate lover: all your hard, unforgiving edges melt away in its broad, beneficent, light-giving Being. “Slowly, as you feel more and more filled with light, you may feel as if you have returned to a place that feels familiar. For as it is taught in many wisdom traditions, your true self is a ray of light descended from the Sun of Suns, the Divine source. “During the course of your journey on earth, however, the core of light within you became veiled, eclipsed by the darkness of forgetfulness and ignorance. Now, experience the joy and love that comes from reconnecting with your genuine heritage as a being of light. “Finally, close your meditation by experiencing the light coalesce into a solar disc within the inner chamber of your heart. “Recall, for instance, images of saints and prophets whose hearts were aflame with love of God, light streaming from this divine center through their fingertips, illuminating their faces, shooting out the top of their head in aureoles of luminescence. It is the power of their faith that burns so brightly; it is knowledge of their true origins that generates their soft glow. *NEW MOON* Blessings to all! What glorious confirmation of the impulse of new beginnings! I so appreciative the collective wisdom freely shared. May the blessing be! I religiously read your posts and I just love them. Chad Woodward channeled the previous lunations very well…a lot of ego fear reallizations to come to terms with. But at the same time I now feel the shift towards more movement and growtg even in the face of such realities. love the new thoughts that I am a ray of light. light up the body.